The aim of the work was to investigate the influence of support on the catalytic performance of Ni catalysts for the glycerol steam reforming reaction. Nickel catalysts (8 wt%) supported on Al2O3, ZrO2, SiO2 were prepared by the wet impregnation technique. 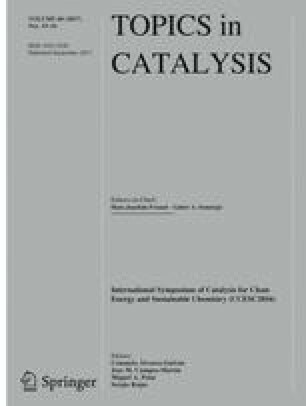 The catalysts’ surface and bulk properties, at their calcined, reduced and used forms, were determined by ICP, BET, XRD, NH3-TPD, CO2-TPD, TPR, XPS, TEM, TPO, Raman, SEM techniques. The Ni/Si sample, even if it was less active for T <600 °C, produces more gaseous products and reveals higher H2 yield for the whole temperature range. Ni/Zr and Ni/Si catalysts facilitate the WGS reaction, producing a gas mixture with a high H2/CO molar ratio. Ni/Si after stability tests exhibits highest values for total (70%) and gaseous products (45%) glycerol conversion, YH2 (2.5), SH2 (80%), SCO2 (65%), H2/CO molar ratio (6.0) and lowest values for SCO (31%), SCH4 (3.1%), CO/CO2 molar ratio (0.48) among all samples. The contribution of the graphitized carbon formed on the catalysts follows the trend Ni/Si (I D /I G = 1.34) < Ni/Zr (I D /I G = 1.08) < Ni/Al (I D /I G = 0.88) and indicates that the fraction of different carbon types depends on the catalyst’s support nature. It is suggested that the type of carbon is rather more important than the amount of carbon deposited in determining stability. It is confirmed that the nature of the support affects mainly the catalytic performance of the active phase and that Ni/SiO2 can be considered as a promising catalyst for the glycerol steam reforming reaction. Financial support by the program THALIS implemented within the framework of Education and Lifelong Learning Operational Programme, co-financed by the Hellenic Ministry of Education, Lifelong Learning and Religious Affairs and the European Social Fund, Project Title: ‘Production of Energy Carriers from Biomass by Products. Glycerol Reforming for the Production of Hydrogen, Hydrocarbons and Superior Alcohols’ is gratefully acknowledged. Moreover, the authors also wish to acknowledge financial support provided by the Committee of the Special Account for Research Funds of the Technological Educational Institute of Western Macedonia (ELKE, TEIWM, Grant Number: 80126). L.T. gratefully acknowledges the Bodossaki Foundation for financial support.